Save up to 40% on costs by optimally splitting jobs across your vehicles. 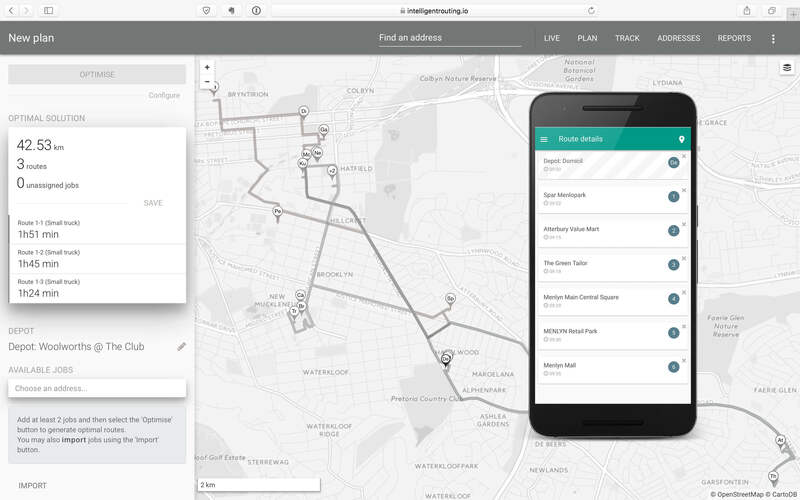 Assign the optimised routes to drivers and track their progress live. 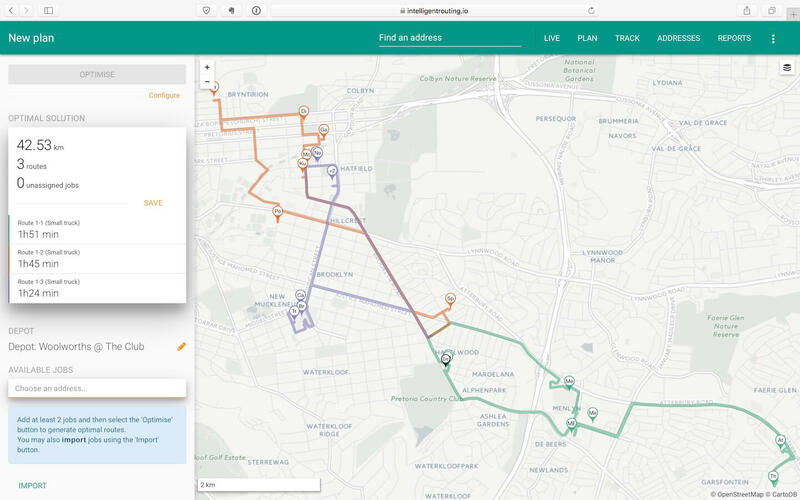 Use the newest technological resources to optimise your planned routes. Track your vehicles' paths and stops made in real-time. Maximise your deliveries and minimize your costs, unlocking spare capacity in your business to grow. Select all the clients you would like to service over a specified period. For your convenience, the client locations will be displayed on a map. Our filtering and grouping functions allow you to fine tune your service areas visually right off the bat. Configure your optimisation as needed. We are capable of handling constraints such as time windows, vehicle capacities as well as custom numeric constraints. You can also specify the types of vehicles in your fleet and optimise against each of their operational costs. Our algorithm handles all of the heavy lifting for you - at the press of a button. Sync your planned routes directly to your drivers via our companion Android App. Your drivers can use the app to navigate to their next destination and log their activities at each client. Simply assign a created route to one of your drivers and save it. A notification will automatically be sent to that driver's app indicating that a new route has been received for the day. Track your fleet in real-time through the day. Every delivery, pickup or service performed by the driver is immediately pushed to the website. This means that you will always have the latest information about vehicle locations and delivery schedules for your clients. View historical tracks and generate reports based on them. All client visits are recorded and linked to their saved addresses. This allows for rich, informative reports about client requirements as well as driver behaviour. Create an account with us to get started on your journey to incredible savings. Add a number of services of any type that require fleets. For instance deliveries, pickups or any other customer-located jobs. 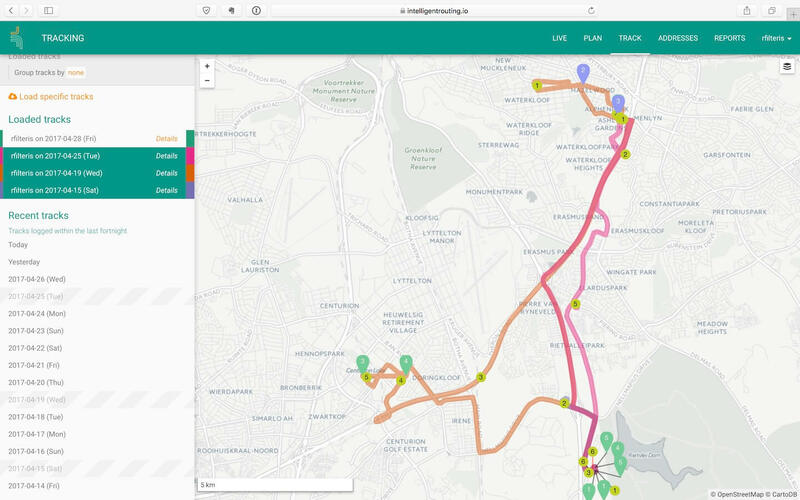 Run our optimisation algorithm and receive optimised routes for your fleet personnel to use. Copyright © Intelligent Routing 2018.